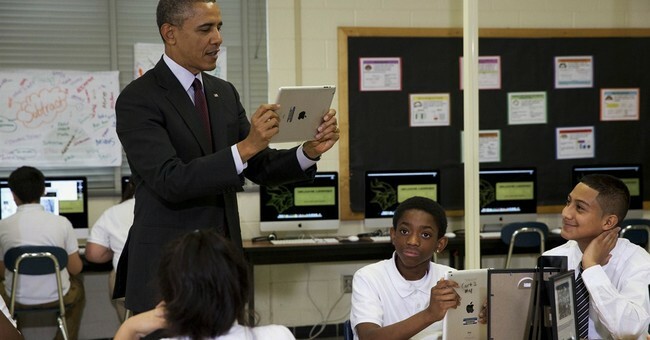 President Obama is passionate about education, especially for underprivileged kids … or so he says. An ardent opponent of school choice, except when it comes to his own kids, one of his first acts was to try to kill the D.C. Opportunity Scholarship that provides poor kids in the nation’s capital the chance to escape failing schools. He’s repeatedly tried to ax the program, only to be blocked by Republicans. But the President’s assault on education doesn’t end with just young kids, it continues throughout the entire education system. For the last few years, the Obama administration has waged a war against for-profit colleges, higher education institutions whose student body is made up of non-traditional students – older and poorer – seeking to obtain marketable skills in this weak economy. The Department of Education has been attempting to impose new regulations on these schools, restricting student loans for applicants, which would shut many of them down and limit higher education options for millions of students. While every college-bound student would undoubtedly love to attend Columbia or Harvard, that’s simply not in the cards for most people. For the rest of us, it’s smaller schools, cheaper schools, state schools. But a four-year college isn’t for everyone, especially right out of high school. Some people, myself included, aren't mentally ready for college right out of high school, and many more simply want to learn a trade. That’s who the Obama administration is targeting with their latest attempt to regulate for-profit schools out of existence. While I, after couple of years off and working a long string of jobs I hated, got my act together and went to a four-year state school, many of my friends simply floundered. The options available today didn’t exist then, so they drifted. They weren’t "A" students, they weren’t academically minded, nor were they particularly driven. But they didn’t have to be in order to make a living. In the late 1990s, the economy was in much better shape and good jobs existed. But the so-called Obama recovery has produced mainly part-time work and service jobs. Those who want sustained careers need additional education, and for-profit schools, in many cases, are the only ones offering it to them. With all the whining liberals do about some people earning more than others, also known as “income inequality,” it’s odd they would move to cut off any avenue to higher potential earnings, especially for low-income and older Americans seeking to better themselves. But that’s exactly where we are today … again. I first wrote about this in 2011, when cronyism and scandal enveloped Democrats’ attempt to kill for-profit schools. But failure and corruption has never deterred Democrats from pushing forward their agenda, so we’re dancing to the same song again. It was, of all things, comedian Rob Schneider who put this issue back on my radar screen when he told Philadelphia radio host Chris Stigall, “There’s not one segment of business under the Obama administration that hasn’t been hurt…he attacks for-profit schools, which is totally an elitist thing from a guy that went to Harvard.” Deuce Bigalow is correct. As the Washington Post put it, the Obama Administration is attempting to implement rules for student loans that “would cut off financial aid to career-oriented programs whose graduates have high student-loan debt relative to their incomes.” Sounds sensible, right? If, of course, you don’t mind the government deciding what is a worthy career pursuit for you. But, as always, the devil is in the details. In other words, your unmarketable 1940s bisexual polar bear studies degree from Overpriced U will be unaffected, but your computer repair Associate’s Degree from a technical school that happens to be accredited but privately owned would be subject to the new rule. But this isn’t a simple rule, it’s 845 pages of regulations. And it's not meant to stop students from making bad decisions. It is a series of flaming hoops for-profit colleges will need to jump through, meant to make it impossible for students to choose a school the current occupant of 1600 Pennsylvania Avenue deems unworthy. As is always the case with these massive regulations, they’re written without regard to the fact that these schools are the prefect fit for millions, and the only option for many. Like Obamacare, this proposed set of regulations are a one-size-fits-all mess meant to protect people from themselves and punish those with whom the Obama administration has made a value judgment against. They don't believe profit should be anywhere in health care or education; those are “fundamental rights” to the left. It’s the nanny state inserting itself into our lives even further. It’s yet another attempted denial of “choice” by those who wrap themselves in the moniker so completely you tend to forget they mean it in only one, very specific way. It is regulatory spandex. And as any weekend trip to a mall can tell you, one size definitely does not fit all, especially in a nation of 330 million people. If the Obama administration finally gets its way, the government will say people can get an education anywhere they like, as long as the government approves of their choice. It’s the essence of progressivism, so, in a way, it’s an education for everyone, except this one is more expensive and leads to more unemployment than anything the government is seeking to limit.